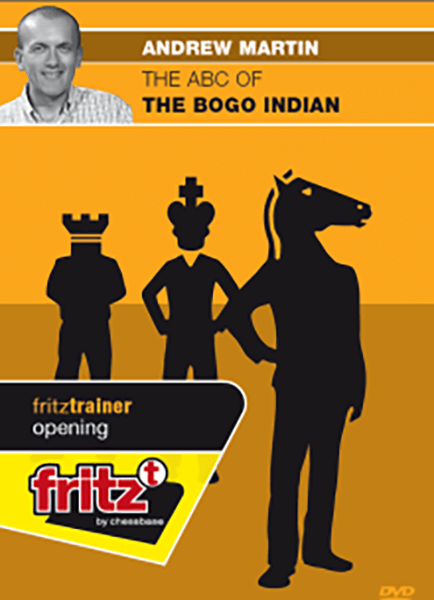 The Bogo Indian is an attractive system for players of all levels. It provides a sound platform from which Black can begin the middlegame with confidence. After 1.d4 Nf6 2.c4 e6 3.Nf3 Bb4+ Black develops smoothly and prepares to castle. He retains maximum flexibility with his central pawns. You do not need to know an enormous amount of theory to play in this natural way and of course, this is the attraction for the club player. On ‘The ABC of the Bogo Indian’, Andrew Martin argues that this opening is best understood in terms of pawn structure. He demonstrates the different structures that may arise after 4.Bd2, 4.Nbd2 and 4.Nc3 and gives repertoire suggestions against each. Over nearly 5 hours and 35 or so games, nearly all of which are played by GM’s and IM’s, you will learn how this opening works. You will then be ready to use it in your own games.